Solar Clean Energy - Really? 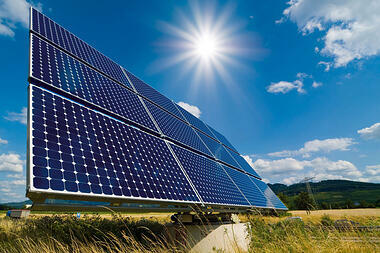 The solar energy industry has a silent problem that has been receiving more publicity of late. Fueled partly by billions in government incentives and green investment dollars, the industry is creating millions of solar panels each year and as a result, millions of pounds of polluted sludge and contaminated water. Solar energy is a far less polluting energy source than coal or natural gas, but the nevertheless many manufacturers of panels are struggling with a hazardous waste problem. Solar panel manufacturers are subject to the same hazardous waste laws that all businesses and organizations are, and as a result of the increase in manufacturing, companies must comply with federal and state “cradle to grave” laws. To dispose of their hazardous byproducts, the companies must transport it by truck or rail far from their own plants to waste facilities hundreds and, in some cases, thousands of miles away. The waste from manufacturing is becoming a concern within the industry. With the California Department of Toxic Substances Control (DTSC) announcing the exploration of plans to cut hazardous waste in half by 2025, this is adding new pressures to manufacturers. California is becoming a hotbed for this issue. 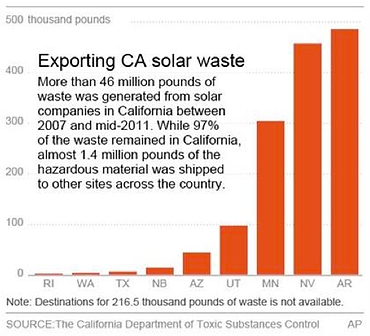 California is a leading state for the manufacturing of solar panels. DTSC requires manufacturers to report hazardous waste generation and where the waste is disposed of. It will be interesting to see what happens as this situation evolves, as the solar industry, once the “darling” of the green movement is now becoming labeled as a hazardous waste polluter. For companies in other industries, it remains important stay informed to what is happening on the regulatory side. For companies in California the writing on the wall is clear, the state wants to cut the disposal of hazardous waste in half and if you generate hazardous waste, you better find ways to reduce your disposal rates. To stay informed, sign up for our newsletter and get access to our case studies and EBooks and learn about new ways to manage your hazardous waste streams, navigate federal and state hazardous waste regulations and stay out of trouble with DTSC.